This program develops a sense of place and stewardship. We bring youth from surrounding communities to one of the Portland Metro area’s premier local waterways. Hundreds of students join us for several full-day explorations of sites within the Sandy River Basin. These sites include the 1500 acre Sandy River Delta, Oxbow Park, and the former Marmot dam site. We place emphasis on the confluence of natural and cultural significance of these places in the Columbia River region. In 2012 Carson Abbert of Walt Morey Middle School asked his 120 students if they'd ever visited their local wildlife park, the Sandy River Delta. Only 10 students raised their hands. This sobering response inspired Mr. Abbert to partner with us to bring his students to the Delta on guided educational adventures. Over 1000 youth now take part in environmental and stewardship education at the Delta every year. 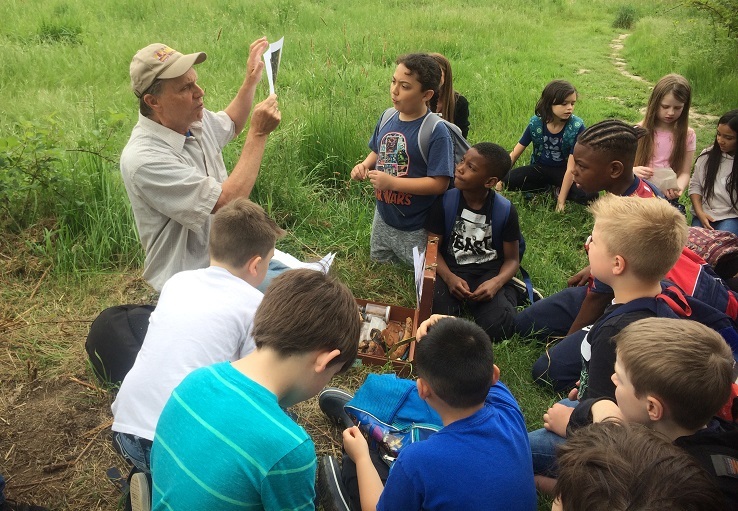 During field adventures classes separate into four groups to provide a low student to teacher ratio. Native American Tradition Keepers teach students about their culture and traditional foods found at the site. Each group also takes a trip to the Maya Lin bird blind, an art installation at the Delta. Students also get to take a hands-on approach to ecological restoration. We invite each student to practice scientific sampling techniques, and take part in native plant installation. For Delta EE information, please contact Bill Weiler, bill@sandyriver.org.